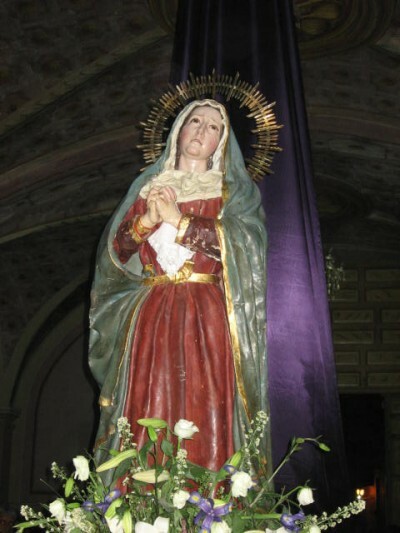 This life-sized Mary was photographed during Easter Week in San Miguel de Allende in 2009. Can you feel the suffering, the love, the benevolence that she exudes? She is no doubt revered and loved…gazed upon and prayed to untold times over the ages…prized by all. For more A Virgin A Day, visit Rebecca @ http://corazon.typepad.com/. ~ by Dawn Elliott on December 1, 2012. Good morning, Dawn. We meet with our beloved mother again on these twelve special days. Her strength, fueled by unconditional love, is a joy to behold. The passion on her face,her hands,the way she stands, all certainly evoke emotion. LOVELY. The deep caring and experiencing of the totality of Life is evident in this statue. It must be amazing in that it’s life size! Hello dear Dawn. There is a lot of passion on her face. She is filled with caring. Beautiful. That is a lovely statue. i hope mary will pray continuously for us to return to her this holy week in san miguel !!! i am burning with a passion that it will be so! many are called, but who will follow??? She looks as if she is conversing with the I AM, waiting to give voice to the passions and cares within.